I have tried to make the Compendium easy to use, but there are some features that you may not notice or that are not straightforward. The Status field contains the abbreviated name of the organisation that approved the common name. Many of the data sheets contain more information – move your mouse so that the cursor is on the abbreviation, and you will see the additional information in a tooltip. Some browsers show this additional information in the Status Bar at the bottom of the browser window. Almost all Web browsers allow you to bookmark a Web page so that you can return to it easily. However, this does not work for pages that are displayed in frames, such as the indexes of the Compendium. If you want to bookmark a data sheet that is displayed with an index, click the “Hide index” link at the bottom of the data sheet. This will display the data sheet alone, so that you can bookmark it. 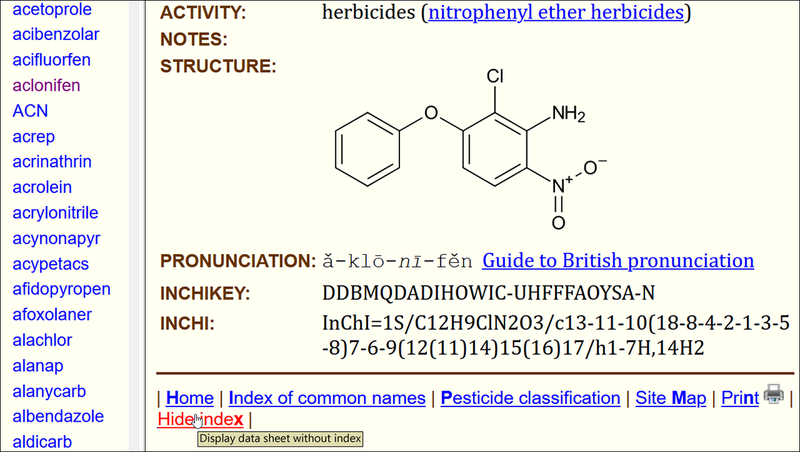 The “Hide index” link is not shown when a data sheet is displayed alone. The data sheets for pesticides in ISO 1750-1981 Pesticides and other agrochemicals – Common names (including its addenda and amendments) and in ISO 765-1976 Pesticides considered not to require common names can display buttons that help you to navigate the Compendium, including browsing through the data sheets in alphabetical order, or jumping to the first or last data sheet. Navigation buttons are also available for moving between the various indexes that are part of the Compendium. Most browsers have dropped support for navigation buttons, but they are still available in iCab and SeaMonkey (formerly Mozilla). These navigation buttons are not available in Edge, Firefox, Internet Explorer, Safari, OmniWeb or Netscape. The style reverts to normal when you go to another page, and so you need to select the “High visibility” style sheet on each page that you visit.